SAN FRANCISCO — Wine Institute has released a new video, "California Wines Green Tour," at www.discovercaliforniawines.com/media-trade/videos, featuring a traveler enjoying the state's beautiful wine regions while experiencing sustainable winegrowing and winemaking practices. In Green Tour, viewers get a snapshot of what sustainable winegrowing means--from using solar energy and preserving water, to planting cover crops between vine rows for soil health and attracting beneficial insects. The traveler also learns about how sheep graze on vineyard weeds and owls prey on vineyard pests. All of the practices have the goal of enhancing environmental stewardship and social responsibility as well as grape and wine quality. 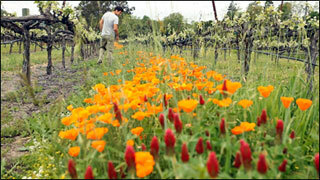 The video release coincides with California's Down to Earth Month in April when dozens of wineries across the state are celebrating with special green-themed events, eco-tours and offers for visitors. See the calendar listings at: www.discovercaliforniawines.com/d2e. Among the events that visitors can enjoy are San Luis Obispo County's FarmFest on the Coast on April 26-27 which will offer local, sustainably grown wine and edibles at Dinosaur Caves Park overlooking the ocean in Pismo Beach. Central Coast wineries are also offering an Earth Day Food & Wine Festival with more than 200 growers, vintners and chefs serving local wines and foods with music, dancing and more April 20. The Santa Cruz Mountains Winegrowers Association Passport Day celebrates its earth-friendly wine region with organic wine trails, barrel samples and special tasting flights on April 20 to support the Save Our Shores nonprofit dedicated to clean beaches. Livermore Valley wineries are highlighting sustainable winegrowing and winemaking with special "Down to Earth" tours and tastings April 21 and at Down to Earth with Napa Green Certified Wineries, one can learn about green design, conservation and creative re-use as well as attend related tasting events April 19-21. Mendocino wineries are offering Where the Earth IS First Fest April 19-28 where visitors will enjoy a host of eco-friendly activities and organic wine and food. From April 1-30 in Northern Sonoma County, the Green Trail of Dry Creek Valley offers a special, customized experience exploring the region's certified organic and certified biodynamic wineries. Wine Institute, the association of 1,000 California wineries and wine-related businesses, co-founded the California Sustainable Winegrowing Alliance (CSWA) with California growers a decade ago to advance the California wine industry's adoption of earth-friendly practices. To date, 1,800 vineyard and winery organizations participate in CSWA's sustainability program and they represent more than 70 percent of California's winegrape acreage and case production. As the world's fourth leading wine producer, California is a leader in sustainable winegrowing with one of the most comprehensive and widely adopted sustainability programs in the world. Journalists requiring more information can contact communications@wineinstitute.org.